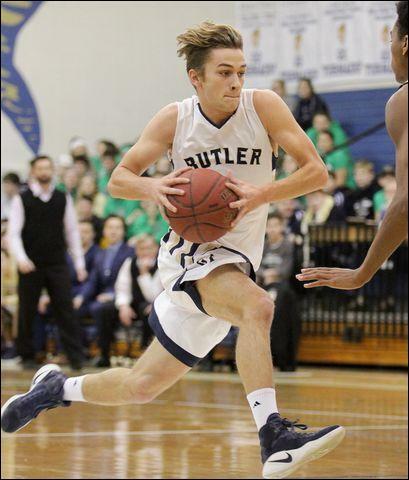 Butler guard Luke Michalek drives to the hoop during Butler's 70-63 win over Central Catholic Monday night. Michalek had 14 assists in the win. BUTLER TWP — Luke Nedrow buried a trey and a six-point Butler halftime lead was suddenly a seven-point deficit with 14 seconds left in the third quarter. The Golden Tornado countered with a Luke of their own — Michalek — and momentum suddenly shifted. Instead, Butler posted a 70-63 Section 1-6A boys basketball win over Central Catholic. Michalek wound up with 14 assists in the game — none bigger than the ones he produced late in the third period and early in the fourth. With the Tornado (12-1, 4-1) trailing 46-39 after Nedrow's shot, Michalek found his brother John open in the corner for a trey just before the period ended. Luke Michalek sank a trey of his own to begin the fourth quarter and Butler was within one. He then hit Tarik Taoufik under the basket for a lay-up, found John Michalek for another trey, then Ethan Morton for a lay-up. Butler had a 52-48 lead with 6:10 to play and never trailed again. Ethan Morton sank five free throws in the finasl two minutes for the Tornado. He led Butler with 22 points, 11 rebounds and added four assists. But it was Luke Michalek who energized his team's offense. “He annihilated their pressure,” Clement said of Michalek. “He blew right past it. He's the best athlete I've ever coached. He could play college basketball, college football, either one. Taoufik scored 12 points for the Tornado while John Michalek added 11. Butler sank all nine of its field goal attempts — including a pair of treys — in the fourth quarter. The Tornado scored 28 points in the final eight minutes after being outscored 21-11 in the third quarter. “Once we were able to push the ball up the floor, things opened up,” Luke Michalek said. “We'd drive the lane and kick it out, or dish it underneath. And when Butler's guard tandem is on its game, “it's tough to beat us,” Michalek admitted. Nedrow did not score a point in the first half for Central (6-6, 5-1), but struck for 18 in the second half. He had seven rebounds as well. Juston Tarrant had 10 points and five boards, Cole Mason 10 points and four assists, Tommy Farkos 10 points for the Vikings. “They beat Pine (-Richland) and they're 5-1 at the halfway point, so they are the standard in the section right now,” Clement said. “This is a nice win for us. Maurice Shipman 1-6 0-0 3, Cole Mason 4-9 1-4 10, Luke Nedrow 7-11 2-2 18, Tommy Farkos 5-8 0-0 10, Brian Dzuban 1-4 0-0 3, Brandon Boyce 1-7 1-2 3, Carlan Gray 2-4 0-0 6, Justin Tarrant 4-7 1-4 10. Totals: 25-56 5-12 63. Luke Michalek 3-4 0-0 7, John Michalek 4-4 0-0 11, Mattix Clement 0-2 0-0 , Tarik Taoufik 6-9 0-0 12, Luke Patten 3-4 2-2 9, Mason Montag 1-2 0-0 3, Ethan Morton 6-12 10-14 22, Isaiah Scribner 2-4 0-1 4, Nick Stazer 1-1 0-0 2. Totals: 26-42 12-17 70.